The abdominal muscles form the anterior and lateral abdominal wall and consist of the external abdominal obliques, the internal abdominal obliques, the rectus abdominis and the transversus abdominis . Acting together these muscles form a firm wall that protects the viscera and they help to maintain erect posture. In addition the contraction of these muscles helps in expiration and to increase the intra-abdominal pressure such as in sneezing, coughing, micturating, defecating, lifting and childbirth. 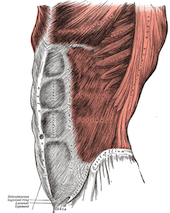 The external abdominal oblique muscle is the largest and most superficial of the four muscles and lies on the sides and front of the abdomen. It is broad and thin with it's muscular portion occupying the side and it's aponeurosis the anterior wall of the abdomen. It arises from the external surface and inferior borders of the lower eight ribs. 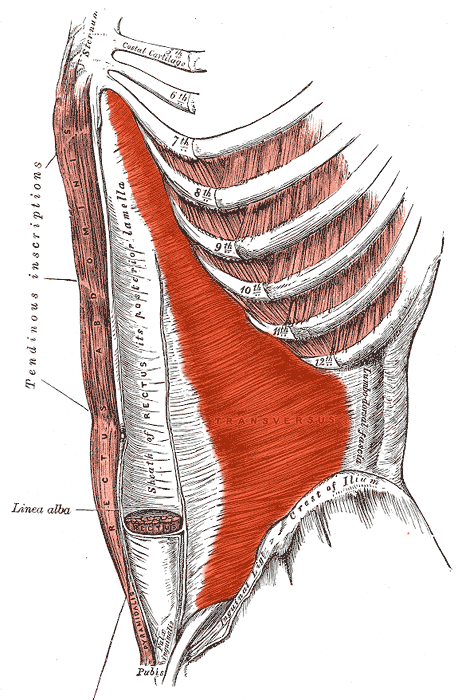 The fibres from the lowest ribs pass nearly vertically downwards and are inserted into the anterior half of the iliac crest; the middle and upper fibres, directed inferiorly and anteriorly, end in an aponeurosis at approximately the mid-clavicular line and insert into the xiphoid process, the linea alba, the pubic crest and the pubic tubercle . The external abdominal obliques are supplied by the lower six thoracic nerves and the iliohypogastric and ilioinguinal nerves. Both sides acting together, the external abdominal obliques flex the vertebral column by drawing the pubis towards the xiphoid process. Acting unilaterally it results in ipsilateral side flexion and contralateral rotation of the trunk. The internal abdominal oblique muscle is also a broad thin muscular sheet that lies deep to the external oblique muscle. It arises from the thoraco-lumbar fascia, the anterior two-thirds of the iliac crest and the lateral two-thirds of the inguinal ligament. 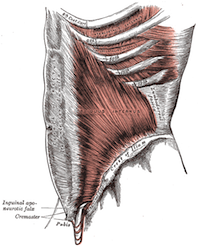 The muscle fibres radiate superomedially and insert into the inferior borders of the lower three ribs and their costal cartilages, the xiphoid process, the linea alba and the symphysis pubis. Near their insertion the lowest tendinous fibres are joined with similar fibres from the transversus abdominis to form the conjoint tendon. The internal abdominal obliques are innervated by the lower six thoracic nerves and the iliohypogastric and ilioinguinal nerves. Acting unilaterally, contraction of the internal oblique results in ipsilateral side flexion and rotation of the trunk. It acts with the external oblique muscle of the opposite side to achieve this torsional movement of the trunk. It also acts to compress the abdominal viscera, pushing them up into the diaphragm, resulting in a forced expiration. The transversus abdominis muscle is the deepest of the abdominal muscles, lying internally to the internal abdominal obliques. It is a thin sheet of muscle whose fibres run horizontally anteriorly. It arises as fleshy fibres from the deep surface of the lower six costal cartilages, the lumbar fascia, the anteror two-thirds of the iliac crest and the lateral third of the inguinal ligament. It inserts into the xiphoid process, the linea alba and the symphsis pubis. The lowest tendinous fibres join similar fibres from the interior obliques to form the conjoint tendon which is fixed to the pubic crest and the pectineal line. The transversus abdominus muscle is innervated by the lower six thoracic nerves and the iliohypogastric and ilioinguinal nerves. Contraction of the transversus abdominis has a corset like effect , narrowing and flattening the abdomen. It's primary function is to stabilise the lumbar spine and pelvis before movement of the lower and /or upper limbs occur. The rectus abdominis is a long strap muscle that extends the entire length of the anterior abdominal wall. It is broader above and lies close to the midline, being separated from it's fellow by the linea alba. It arises by two heads from the anterior aspect of the symphysis pubis and the pubic crest and it inserts into the 5th , 6th and 7th costal cartilages and the xiphoid process. Each rectus abdominis is divided into three distinct segments by three transverse fibrous intersections, one at the level of the xiphoid process, one at the umbilicus and one halfway between the two. The rectus abdominis is enclosed between the aponeuroses of the external and internal obliques and transversus abdominis which form the rectus sheath. The rectus abdominis muscle is innervated by the lower six thoracic nerves. 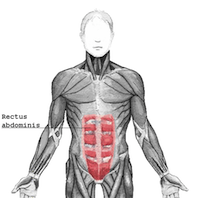 The rectus abdominis is an important postural muscle. With a fixed pelvis, contraction results in flexion of the lumbar spine . When the ribcage is fixed contraction results in a posterior pelvic tilt. It also plays an important role in forced expiration and in increasing intra-abdominal pressure. ↑ Drake RL, Vogyl AW, Mitchell AW. Gray's anatomy for students. 3rd edition. Philadelphia: Churchill Livingstion Elsevier; 2015. 282p. ↑ 2.0 2.1 2.2 2.3 Gray H. Grays Anatomy. 37th ed. Edinburgh: Churchill Livingstone, 1989. ↑ Lee D. The Pelvic Girdle. 2nd Ed. Edinburgh: Churchill Livingstone, 1999.